Environmental conditions play a major role in shaping reptilian embryonic development, but studies addressing the impact of interactions between chronic and acute environmental stressors on embryonic systems are lacking. In the present study, we investigated thermal dependence of cholinergic and adrenergic cardiovascular tone in embryonic American alligators (Alligator mississippiensis) and assessed possible phenotypic plasticity in a chronic hypoxic incubation treatment. 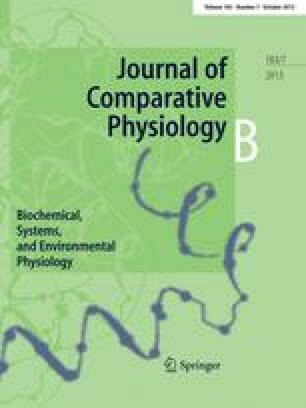 We compared changes in heart rate (f H) and mean arterial blood pressure (P M) for chronically hypoxic and normoxic-incubated embryos after cholinergic and adrenergic blockade following three different acute temperature treatments: (1) 30 °C (control incubation temperature), (2) acute, progressive decrease 30–24 °C then held at 24 °C, and (3) acute, progressive increase 30–36 °C then held at 36 °C. f H progressively fell in response to decreasing temperature and rose in response to increasing temperature. P M did not significantly change with decreasing temperature, but was lowered significantly with increasing acute temperature in the normoxic group at 90 % of development only. Propranolol administration (β adrenergic antagonist) produced a significant f H decrease at 24, 30, and 36 °C that was similar at all temperatures for all groups. For normoxic-incubated embryos at 90 % of development, atropine administration (cholinergic antagonist) significantly increased f H in both 24 and 36 °C treatments, but not in the 30 °C control treatment. This atropine response at 24 and 36 °C demonstrated acute thermally dependent cholinergic tone on f H late in development for normoxic-incubated, but not chronically hypoxic-incubated embryos. Collectively, data indicated that cardiovascular control mechanisms in embryonic alligators may be activated by thermal extremes, and the maturation of control mechanisms was delayed by chronic hypoxia. Our work would not have been possible without help from Phillip “Scooter” Trosclair III and Dwayne LeJeune. We thank Kevin Tate and Zachary Kohl for assistance with embryo care and data collection. The National Science Foundation CAREER award IBN IOS-0845741 to DAC supported this work.